This full size Chinese viola bow for sale, made by the Jacques Remy company in 2010, is a very good entry level bow. The Remy is made of brazilwood and the stick is octagonal with a frog made from ebony. This bow is a substantial step up for any beginning violist who is contemplating a fiberglass bow. The handling and camber are significantly superior to fiberglass bows. 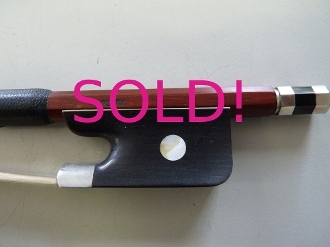 This viola bow is new from the factory and in unused condition. This Remy viola bow would be a good choice for an aspiring violist or an advancing violist who wants a spare bow.